This time of year our friends up north are living in cold, snowy climates. Oftentimes, they’re spending much of the winter indoors, breathing each other’s stale air and germs, to the point where many of our northern friends are sick. The flu is particularly nasty this time of year, and if you read your friend’s Facebook posts, you’re likely to discover how many of them are complaining about how sick they are. Now, for those living in sunnier, warmer climes, like Florida and Mexico, that’s not the case. These folks are outdoors often in the winter, enjoying life, surrounded by green trees, flowers, birds, and more. And many of them enjoy spending time taking in glorious sunsets while their northern friends live in a place where they barely see the sun each winter. Did you know that in certain parts of Florida, people gather together to watch the sunset on beaches? In Naples, Florida, for instance, they even have a bell they ring as the sun sinks into the ocean and darkness falls. You can find this bell at Gumbo Limbo on Vanderbilt Beach. 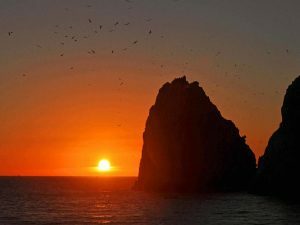 If and when you’re in Cabo, you should consider taking a sunset cruise. For starters, you’re exposing your body to nature– and all your five senses come alive. Next, on a cruise, you have the camaraderie of several other people who want to have a good time together– there’s a party element to it. A sunset cruise is a time to smile, laugh, drink, and feel good– it’s not a humdrum glum time! Also, you can be inspired by the amazing beauty of seeing a sunset over the water. It can turn the air and water into different hues– pink, orange, green, you name it! Interestingly, it also tells your inner body clock, “Okay, the day is done. Get ready for nighttime.” Therefore, a sunset is nature’s way of helping you wind down after a long day. Finally, being on the water is a serene feeling. It’s no wonder that, for generations, so many people have been sailors, fishermen, and even pirates. There’s just something so special about being on boats, especially as the sun goes down each night. Guerita Sportfishing may be known for taking fishermen out to sea in and around Cabo, but our company also does sunset cruises. These cruises are for you and your significant other to feel romantic, while taking in nature’s beauty all around you. Our luxurious boat accommodates 8 people at most, so it’s never overly crowded. Get away from the maddening crowds and take a sunset cruise with Guerita Sportfishing.